Don't get me wrong. I love to eat pies, and I adore the people who make them. It is the obscure and quite impenetrable construction process that I try to avoid. Cooking in a cast iron skillet or a soup pot I get: you taste it as you go along, and you pretty much know how it is going to turn out. 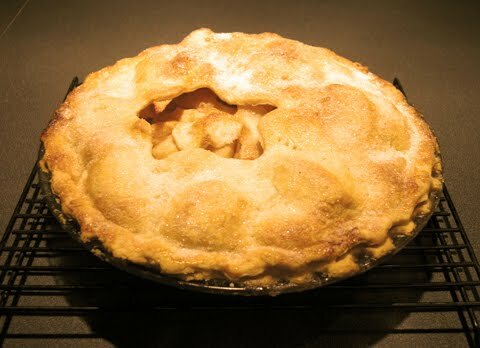 An unbaked pie, all pale and cold, gives you precious little clue as to its future success or failure. And the entire project is uncorrectable until it comes out of the oven. Too late then, except for a gigantic ice cream rescue or a shroud of whipped cream. I also think the requirements are vague and smugly mysterious How could the same substance resemble both tiny peas and coarse meal (Which by the way, is what? Cornmeal before it goes through its last grind at the corn meal factory? Who among us has encountered that?) Peas are quite round and green. Coarse meal is lumpy and not green. How cold is cold for the shortening? How over is overworked? Does it make sense to make something by hand that your hands should not touch? My darling daughter-in-law contends that you just know these things. That is why I let her make the pies, and they are fine ones.